The information presented in this blog is based on my own research, experience, and sometimes opinions. I am not a doctor or medical professional of any kind. Please consult your doctor, a nutritionist, or other appropriate health care professional before making any dietary or health changes. Any views, opinions, or facts found in the blog comments are those of the respective commentor and do not necessarily reflect my own views, opinions, or research. I reserve the right to moderate comments to maintain the respect of racial, religious, personal, and political sensitivities of my audience as a whole. 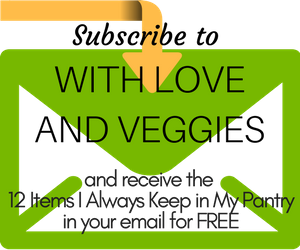 Additionally, With Love & Veggies is a participant in the Amazon Services LLC Associates Program, an affiliate advertising program designed to provide a means for sites to earn advertising fees by advertising and linking to amazon.com. With that being said, I hope you enjoy this blog, learn from it, try new things, comment, share, have fun, and above all, remember to eat your veggies!